Rusty: In this class we'll look at a swing example and some licks that will follow along with it. The example is based off of the C harmonic minor scale. We'll explore this scale and add some of Brian's signature licks to help make you sound like "Stray Cat Strut". Rusty: The harmonic minor scale follows this step pattern ( 1 - 2 - b3 - 4 - 5 - b6 - 7 ). Rusty: These are the two main scale forms I used to build the leads. Play the scale by itself and it will work over the whole jam track. You can also use the C minor blues with our example. Here is the scale I mainly used for the example. Rusty: The combination of those two scales will make some nice Setzer licks. I'll show you more when we cover the licks. Because of the step pattern in the harmonic minor scale, we get some interesting chords that can be used for the rhythm. You don't have to use three or four tone chords. You could play power chords or fifths built off of the notes in the scale. I do that over the first 4 bars of the example. With this type of music there is normally a melody created with the leading tones of each chord. You may think of that as the bass line. That's how I came up with this example. You could fool around with the scale and make up your own melody. Then go back and substitute the full chords in your song. Rusty: After coming up with a rhythm or melody I used the following chart to substitute in the full chords. I play these over the 2nd 4 bars. Rusty: That gives us the following rhythm chart. Rusty: Notice I used Cm and Eb aug rather than the full 4 tone chord You can use either one and they will work for this lesson. Here are the chord positions I used or would use for the 4 tone chords. Rusty: That takes care of the chords you could use in the rhythm. Next I would pick out some other voicings or triads that would work along with the rhythm. Here is an example of that. I need to make a correction. On the tab I have E aug as a chord and that needs to be Eb aug. The video shows you how I'd play this rhythm part. Notice how I brush the strings with my thumb and index. You can be as dynamic as you like, by playing hard or soft. Rusty: This lick should sound like the intro lick to "Stray Cat Strut". It starts with a normal rock lick bending through the blues scale. Then it plays each note of the G augmented chord, which will work all over this song. 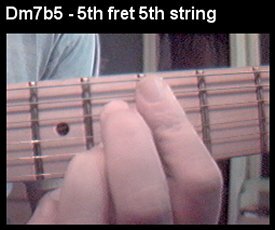 You can normally substitute your V chord with its augmented (#5) chord. Turning it into a lick is one thing that makes Setzer's playing different. Rusty: This small bit comes out of the C harmonic minor scale. I emphasize the crucial note to that scale as the last note. I'm trying to setup the sound of that scale so I can use it later and compare Brian's licks with the scale. 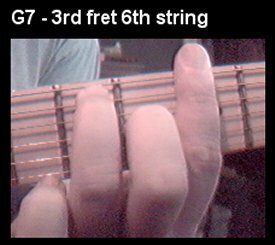 Rusty: Over this part I'm using some chromatics and taking advantage of backing chords Ab and G7. It still has a touch of the C harmonic minor with additional passing tones. Rusty: Here's another lick that is similar to the way Setzer phrases his licks. Again we start with a bend out of the C minor blues and move into some swing. The next lick will tie it all together. Rusty: This part emphasizes the 1/2 step intervals within the harmonic minor but he also throws in the b5 ( from the C minor blues) note that jazzes up the lick and also combines the two scales together. The last part of the lick I threw in a diminished arpeggio to get us back up to the root note. 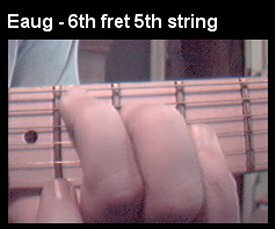 Rusty: Now we're back into the C minor blues scale and using some of the diminished voicings that is comparable to Setzer's style. By now you should see that all along you want to merge the two scales together. Basically take some blues or rock licks that you know and in a few runs from the C harmonic minor scale and you'll start to sound like Setzer. Rusty: Same thing happens here. 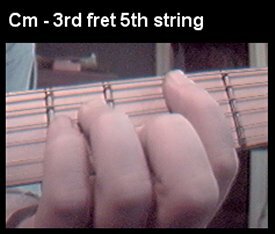 I use some pull - offs from the C minor blues and head right back into the G augmented chord. From this point on I'm experimenting with the C harmonic minor. While trying to build my own licks, I'm thinking of the few things I covered before that will help me sound close to Setzer or either swing. Rusty: This is another lick from our blues scale. The phrasing make's it different and interesting. Rusty: Now I'm taking the idea of adding the b5 from the blues scale with the C harmonic scale. By using the 1/2 step intervals I can come up with something that sounds diminished. Rusty: Another little ditty using the harmonic minor. Rusty: This lick resolves lick 12. Rusty: This lick emphasizes the C minor triad. Rusty: This lick sets up the next lick. I'm trying to emphasize the C minor triad again in a different position. Rusty: Lick 16 sums it all up by arpeggiating through the C minor triad, the C diminished, the B diminished, and ending on the minor third.